Rep. Butch Shaw (R-Pittsford) argues Wednesday against a bill that would require employers to provide paid sick leave. The Vermont House tussled for three hours Wednesday over whether requiring employers to provide paid sick leave is good or bad for business before casting a 76-66 vote for the bill. The close vote, coming late in the legislative session, is an indication of the bill’s uncertain future. A wary Senate would have to waive its rules to advance the bill. Supporters seized the opportunity Wednesday to sell the idea that everybody’s better off if people don’t go to work sick. “Do you want a sick food worker preparing your meal?” asked Rep. George Till (D-Jericho), a doctor who emphasized the danger and cost of food-borne illnesses. "For the vast majority of our businesses this is in fact likely to be a good law, not a bad law." 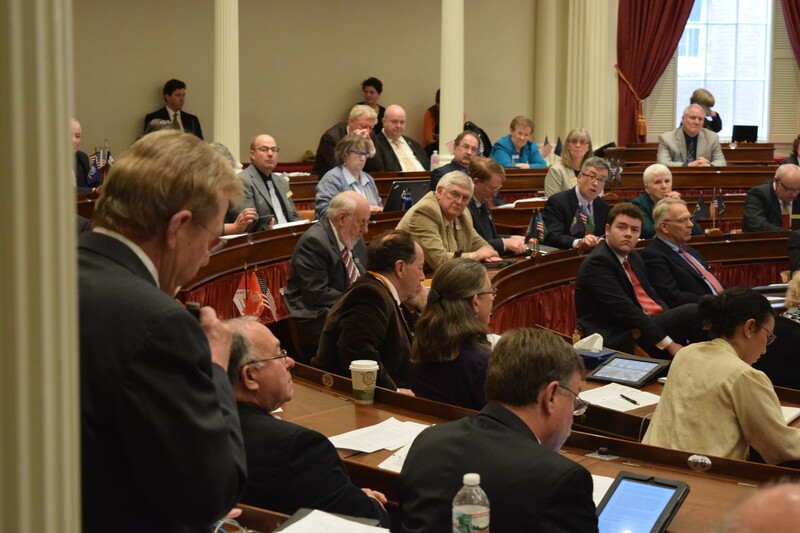 Others argued the bill puts an undue burden on employers. The bill would require employers to provide at least three days of paid leave for employees who have worked at least 1,400 hours, increasing the amount to five days in two years. Employees could use the days when they or their family members are sick, or if their children’s school is closed for an emergency, such as a snow day. Employers who already provide that much paid time off would be unaffected. Temporary and seasonal employees would be exempt. The Republican minority tried numerous tactics to derail the bill, attempting to have it sent to three different House committees for review. “You just said this was a health care bill. If so, why didn’t you send it to the Health Care Committee?” House Minority Leader Don Turner (R-Milton) asked House Speaker Shap Smith (D-Morristown). After those efforts were soundly defeated, Republicans appeared to save their best shot for last. Rep. Patrick Brennan (R-Colchester), chair of the House Transportation Committee, said he had been trying without success for four days to get an answer about whether the bill would increase the cost of road-construction projects that operate under federal labor rules. Rep. Helen Head (D-South Burlington), chair of the House General, Housing and Military Affairs Committee, said she didn't have a definitive answer but expected one by Thursday’s final House vote on the bill. Rep. Tom Stevens (D-Waterbury) said two state officials had advised that the mandate would not create an additional cost for workers covered under the federal Davis-Bacon Act. Sitting in the visitors' gallery, Cathy Lamberton, vice president of the Associated General Contractors of Vermont, said she had received the opposite answer from a federal labor official. Brennan failed to persuade a majority in the House to postpone action on the bill until Thursday so the question could be answered. The House will vote on the bill again Thursday. After that, advocates plan to push for passage in the Senate. Senate Majority Leader Phil Baruth (D-Chittenden), a supporter of the bill, characterizes that as unlikely.